B.Tech, Software Engineer Done with graduation in Electronics & Communication Engineering from JNT University and went to work as a Software Engineer. My passion towards writing help me do writings in my free time. As a business owner or a service provider, one of the principal duties that you need to carry out on a continual basis is hiring qualified experts for various tasks. Hiring personnel for your business is, however, just the first step in the long, tedious road to corporate success. You have a long way to go as you need first to nurture the employer-employee relationship to stand a chance of fulfilling the aims and objectives of the business. When your company’s personnel comprises high-level experts, it can be a daunting task to manage them. Trust and communication are key to forging an efficient, professional relationship. Micromanaging staff members, especially high-level professionals who are valuable company assets, can have a boomerang effect with an adverse outcome. It is quite common for an entrepreneur to regularly shove his or her input down the throat of hired experts. It may be acceptable to deal with low-skilled employees in this manner. While it is your role as a business owner to oversee the activities of each employee, having a “know-it-all” attitude when dealing with seasoned professionals can have disastrous long-term effects on the company. Since your company’s personnel is undoubtedly its most treasured asset, it is crucial to ensure at all times, that there is no conflict between you and your employees. And we should know by now that one sure-shot way to create conflict is by continually nagging veteran professionals on what they need to do. This issue is commonplace when it comes to managing hires from freelancing websites. Most clients make the fatal mistake of insisting on having 100% control on all the tasks assigned to top freelance websites. While this isn’t exactly an ideal working arrangement for either, it is still quite understandable, because the client temporarily employs the freelancer. As a business owner, it is one thing to assign a task to an employee with detailed guidelines, and it is another thing to continuously pass across instructions all through the duration of the task’s execution. While some experts have no issue with the former, many will take great offense to the latter. One of the main drawbacks of practicing this style of entrepreneurial dictatorship is that it often results in a negative outcome for the company. This may have a detrimental effect on the growth of the business and also ruin the company’s corporate culture. High-level experts always need to be given the benefit of the doubt when executing their duties. Otherwise, they will If you insist on repeatedly instructing the experienced professionals to perform their tasks in a certain rigid way, it is certainly guaranteed to rob them of their confidence which eventually leads to poor quality of their work output. If you mostly utilize in-house personnel rather than freelance agencies and freelance platforms, then there are certainly intelligent individuals in your employ that form the backbone of your company. You must endeavour to keep these experts happy otherwise you risk a losing them to a more than willing competitor. Obviously, an apparent way to ensure that your personnel remain committed to the business project is by compensating them with excellent remunerations. Most often, employees who are satisfied with their pay package usually end up being the most productive, and those who struggle with insufficient wages often see the quality of their work suffer. Another way to keep a highly intellectual employee happy is to build trust with the person. This will not be accomplished if you’re regularly telling the person what to do; however, by entrusting an important task to the expert, you’re giving the individual a sense of responsibility. Doing this to all high-profile personnel of your company makes certain that they consider themselves valuable members of your company, and will hence, do their absolute best on any task assigned to them. If you wish to successfully run a business, you must know where the line of authority ends regarding your employees and also do everything to avoid stepping over it. It is understandable that being the head of a corporate entity leaves you with the responsibility of having to delegate tasks appropriately. However, it is unacceptable to attempt to control every aspect of how a high-skilled employee executes his assigned work. Unless the personnel in-charge of your business’s operations are all engaged through the freelance route or have consistently failed to apply their expertise to move your business forward, there is no excuse for you to meddle into how they carry out their functions. It just doesn’t make sense to hire smart people and tell them exactly what to do because the quality of their work will suffer and your business with bear the brunt of the unpleasant outcome. Since most hired experts usually have the experience and the skills to back their expertise, it behoves of you as the owner and manager of the business to give some leeway to such experts. Whether you hire freelancers from top freelancing sites or utilize in-house personnel, the high skilled hires are intelligent individuals who form the backbone of your company. You must endeavour to keep these experts happy otherwise you risk a losing them to a more than willing competitor. One good way to keep a highly skilled employee happy is to build trust with the person. By entrusting a critical task to the expert without petty meddling, you’re giving the individual a sense of responsibility. An apparent way to ensure that your personnel remains committed to the business project is by compensating them with excellent remunerations. Most often, employees who are satisfied with their pay package usually end up being the most productive, and those who struggle with insufficient wages often see the quality of their work suffer. If you can ensure to treat your high-profile personnel well, you can be sure that they will consider themselves as valuable members of your company, and will hence, do their absolute best on any task assigned to them. If you wish to run a business successfully, you must know where the line of authority ends regarding your employees and also do everything to avoid stepping over it. The renowned innovator and entrepreneur, Steve Jobs, had numerous entrepreneurship related quotes that have inspired many business owners worldwide. His quotes are instrumental in the success of many tech companies and other start-ups. You need to understand that extreme micro-management of your hires is guaranteed to yield a disastrous outcome, which can eventually lead to poor business results to the resignation of employees. 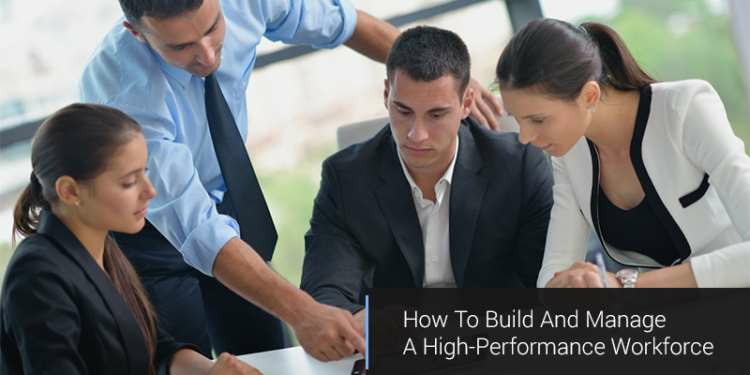 We unlock more solutions that will help you build a formidable high-performance workforce that helps your business achieve long-term stability and revenues. To read more, download our FREE eBook.